This product is no longer available and has been replaced by: BPALK. The PS12ALK typically provided a 12 V, 7.5 Ahr alkaline power supply for the CR500, CR510, CR10(X), and their peripherals. The PS12ALK typically provided a 12 V, 7.5 Ahr alkaline power supply for the CR500, CR510, CR10(X), and their peripherals. It was also used as a separate auxiliary 12 V power supply for remotely located sensor(s) or peripheral(s). However, to avoid errors in analog measurements and ground loops, the PS12ALK needed to share a common ground. The PS12ALK replacement, the BPALK, is the less-versatile, but also less expensive. In contrast to the BPALK, the PS12ALK contained reverse input-protected charging circuitry for charging an external user-supplied battery from a solar panel. The internal alkaline cells in the PS12ALK could not be recharged. A desiccated, non-condensing environment is required. 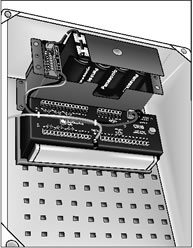 The PS12ALK includes built-in keyhole flanges for mounting to the backplate of a Campbell Scientific enclosure.